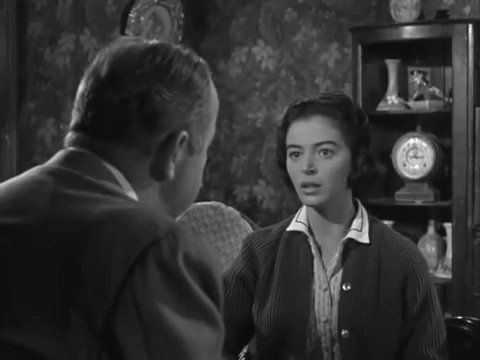 A typical, hard-working FBI officer (Kenneth Tobey) is involved with three cases simultaneously: those of a wanted killer, a car-theft ring and a blackmailer. During a visit to woman who claims to have information on one of these cases, the officer is shot to death, and it’s up to his superior (Broderick Crawford) to find out which of the late man’s inquiries led to his murder. 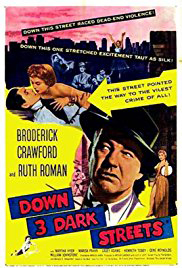 The title of Down Three Dark Streets is metaphorical, referring to the mysteries involved in the trio of cases. It makes the movie sound more of a film noir than it is. It’s actually a routine police procedural. It is interesting to see a fictional detective investigating more than one case at once; I gather that this is normal in law enforcement agencies – the idea of one policeman for every crime must be as close to paradise as most cops dare dream – but I think I’ve seen it elsewhere only on episodes of Barney Miller. In the event, though, this intriguing idea doesn’t really make Down Three Dark Streets intriguing itself. We move from one case to another as different leads are followed and, while this keeps us watching, it does little more than that. Crawford is a bit of a tough actor for me to place. 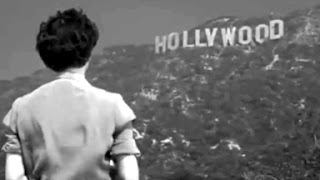 Not compelling enough to be a lead and too strong to be a supporting player, it is telling that his best role and movie was All the King’s Men, in which he shared screen-time with John Ireland, much more of a character actor. In Down Three Dark Streets, Crawford does well but his character never involved me. 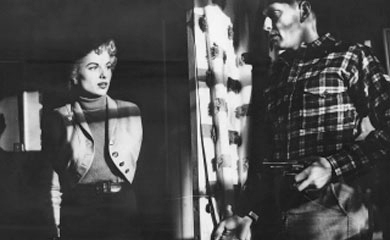 The other performers do better, especially Martha Hyer, as a woman with a doomed fascination for a killer; Ruth Roman, as the frightened blackmail-victim, and Marisa Pavan, as a brave and resourceful blind woman. The real culprit in the film is the writing. This is credited to ‘The Gordons’ (Gordon Gordon (who could have been The Gordons by himself) and Mildred Gordon) and Bernard C Schoenfeld. 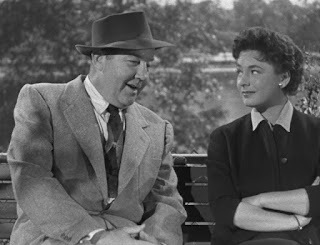 The Gordons seemed to have been principally novelists, perhaps best known, if that can be said in this case, for the novel on which the movie That Darn Cat was based. Here, the story, or stories, are adequate, and no more. The supporting characters carry them, not the script. And the motivation for the killing of Tobey is never revealed; neither is the reason for the call to Tobey in the first place. Even with better writing, though, Down Three Dark Streets may not have been a success. While the trio of cases give a difference to the format of the movie, they also suggest that no one component was strong or interesting enough on its own. Consequently, each becomes padding to the others. The climax has minor tension, but that is the most that may be said of it. Down Three Dark Streets is not even an adequate time-filler, as one feels that the time could have been devoted to any number of more entertaining films. I'm not much of a movie watcher, mostly because I can't sit still that long. It's a little easier these days with PVR and the like. I do like crime stories and was thinking this might be a movie for me, but I'm guessing not, based on the limited story line. No answer for the death of the detective is strange to say the least. I'm impressed you watched the entire movie! I usually try to watch even an entire bad movie just to give it a chance to redeem itself in the third reel.